Our platform makes it possible to create custom segments, tailored to specific campaigns and marketers’ needs. But we can also create audiences connected to current events or holidays. Take a look at World Cup Soccer Fans - segment specially dedicated for the most prestigious football competition. Millions of fans are watching World Cup matches. It is a great time to reach out to soccer fans from all around the world and show them targeted ads i.e. of sports products. 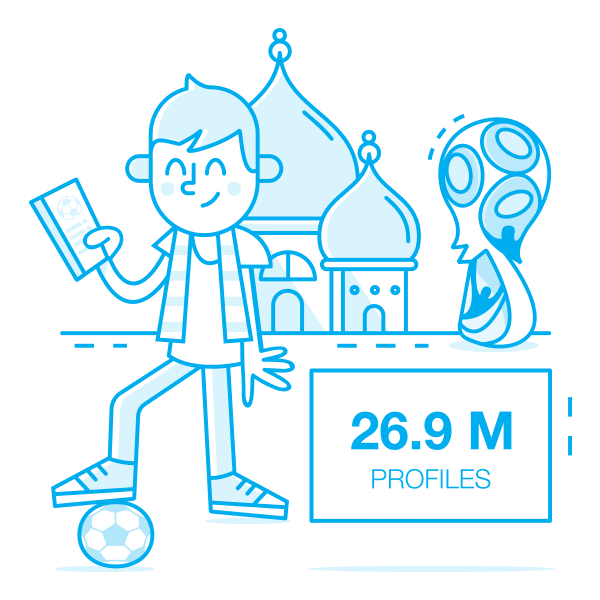 By using Machine Learning algorithms and Big Data analysis we created World Cup Soccer Fans segment specially dedicated for the World Cup in Russia. It guarantees marketers to reach out to customers who are passionate about football and follow the news about national teams. The new segment includes nearly 27 million profiles. Marketers can easily reach out to soccer fans from all around the world and run campaigns with special offers for sports equipment, gadgets, computer games or delivery food! The segment is available through global DSP platforms, e.g., Adform, DoubleClick, MediaMath or Oracle. Why custom segment - World Cup Soccer Fans? By using our new segment, marketers can reach out to customers who are passionate about football and love prestigious competitions. By displaying targeted ads, they can increase sales by sending the right message at the right moment of clients’ buying journey. Check OnAudience.com Data Exchange - a database of over 21B profiles and create a custom segment to run targeted campaigns. Get details of OnAudience.com Data Exchange.